Medical team at work during the Battle of Normandy. 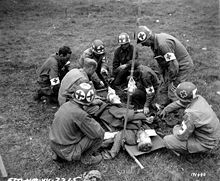 Combat medic or field medic is a US term for military personnel who have been trained to at least an EMT-B level (16-week course in the U.S. Army), and are responsible for providing first aid and frontline trauma care on the battlefield. They are also responsible for providing continuous medical care in the absence of a readily available physician, including care for disease and battle injuries. Combat medics are normally co-located with the combat troops they serve in order to easily move with the troops and monitor ongoing health. Other countries have similar services, but this article is primarily concerned with the US provision. In 1864, sixteen European states adopted the first-ever Geneva Convention to save lives and alleviate the suffering of wounded and sick persons in the battlefield, as well as to protect trained medical personnel as non-combatants, in the act of rendering aid. Chapter IV, Article 25 of the Geneva Convention states that: "Members of the armed forces specially trained for employment, should the need arise, as hospital orderlies, nurses or auxiliary stretcher-bearers, in the search for or the collection, transport or treatment of the wounded and sick shall likewise be respected and protected if they are carrying out these duties at the time when they come into contact with the enemy or fall into his hands." Article 29 reads: "Members of the personnel designated in Article 25 who have fallen into the hands of the enemy, shall be prisoners of war, but shall be employed on their medical duties insofar as the need arises." In modern times, most combat medics carry a personal weapon, to be used to protect themselves and the wounded or sick in their care. During World War II, for example, medics serving the European and Mediterranean areas usually carried the M1911A1 pistol while those serving the Pacific theater carried pistols or M1 carbines. When and if they use their arms offensively, they then sacrifice their protection under the Geneva Conventions. Surgeon Dominique Jean Larrey directed the Grande Armée of Napoleon to develop mobile field hospitals, or "ambulances volantes" (flying ambulances), in addition to a corps of trained and equipped soldiers (infirmiers tenues de service) to aid those on the battlefield. Before Larrey's initiative in the 1790s, wounded soldiers were either left amid the fighting until the combat ended or their comrades would carry them to the rear line. During the American Civil War, Surgeon (Major) Jonathan Letterman, Medical Director of the Army of the Potomac, realized a need for an integrated medical treatment and evacuation system, equipped with dedicated vehicles, organizations, facilities, and personnel. The Letterman plan was first implemented in September 1862 at the Battle of Antietam, Maryland. The United States Army’s need for medical and scientific specialty officers to support combat operations resulted in the creation of two temporary components: the U.S. Army Ambulance Service, established on June 23, 1917 and the Sanitary Corps, established on June 30, 1917. Officers of the Sanitary Corps served in medical logistics, hospital administration, patient administration, resource management, x-ray, laboratory engineering, physical reconstruction, gas defense, and venereal disease control. They were dedicated members of the medical team that enabled American generals to concentrate on enemy threats rather than epidemic threats. On August 4, 1947, Congress created the Navy Medical Service Corps. In the United States, a report entitled "Accidental Death and Disability: The Neglected Disease of Modern Society (1966)", was published by National Academy of Sciences and the National Research Council. Better known as "The White Paper" to emergency providers, it revealed that soldiers who were seriously wounded on the battlefields of Vietnam had a better survival rate than those individuals who were seriously injured in motor vehicle accidents on California freeways. Early research attributed these differences in outcome to a number of factors, including comprehensive trauma care, rapid transport to designated trauma facilities, and a new type of medical corpsman, one who was trained to perform certain critical advanced medical procedures such as fluid replacement and airway management, which allowed the victim to survive the journey to definitive care. 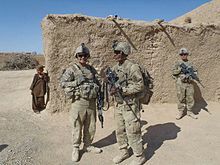 A U.S. Army combat medic (center-left, viewers right) in Afghanistan. Note that the only distinguishing feature is the medical pack on his back. 2010 Haiti earthquake: Israel Defense Forces medical personnel coordinate relief efforts. The International Committee of the Red Cross, a private humanitarian institution based in Switzerland, provided the first official symbol for medical personnel. The first Geneva convention, originally called for "Amelioration of the Condition of the Wounded and Sick in Armed Forces in the Field," officially adopted the red cross on a field of white as the identifying emblem. This symbol was meant to signify to enemy combatants that the medic qualifies as a non-combatant, at least while providing medical care. Islamic countries use a Red Crescent instead. During the 1876–1878 war between Russia and Turkey, the Ottoman Empire declared that it would use a red crescent instead of a red cross as its emblem, although it agreed to respect the red cross used by the other side. Although these symbols were officially sponsored by the International Federation of Red Cross and Red Crescent Societies, the Magen David Adom ("Red Star of David, MDA"), Israel's emergency relief service, used the Magen David (a red star of David on a white background). 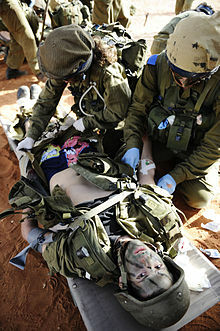 Israeli medics still wear the Magen David. To enable MDA to become a fully recognized and participating member of the International Red Cross and Red Crescent Movement, Protocol III was adopted. It is an amendment to the Geneva Conventions relating to the Adoption of an Additional Distinctive Emblem and authorizes the use of a new emblem, known as the third protocol emblem or the Red Crystal. For indicative use on foreign territory, any national society can incorporate its unique symbol into the Red Crystal. Under Protocol III, the MDA will continue to employ the red Magen David for domestic use, and will employ the red crystal on international relief missions. U.S. Navy Hospital Corpsman providing treatment to a wounded Iraqi soldier, 2003. 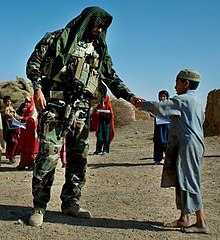 A U.S. Special Forces medic in Afghanistan. Traditionally, most United States medical personnel also wore a distinguishing red cross, to denote their protection as non-combatants under the Geneva Convention. This practice continued into World War II. However, the enemies faced by professional armies in more recent conflicts are often insurgents who either do not recognize the Geneva Convention, or do not care, and readily engage all personnel, irrespective of non-combatant status. As their non combatant status is not respected, many US medics no longer wear non combatant markings. This can enable medics to be used as medically trained soldiers, fighting aggressively rather than just in self-defence. Combat Medics in the United States Army and United States Navy Hospital Corpsmen are virtually indistinguishable from regular combat troops, except for the extra medical equipment they carry. The modern-day interpretation of the U.S. Army doctrine requires medics to carry one primary weapon and, if possible, a secondary weapon. It is also common to find American combat medics who are no longer wearing the red or white cross because it is considered unethical to do so when the combat medic is carrying weapon and could engage in actual combat. In the U.S. Navy, enlisted medical personnel are known as Corpsmen, not medics. The colloquial form of address for a Hospital Corpsman is "Doc." In the U.S. Marine Corps, this term is generally used as a sign of respect. The U.S. Navy deploys FMF Hospital Corpsman attached to U.S. Marine Corps units as part of the Fleet Marine Force. Since the U.S. Marine Corps is part of the Department of the Navy, it relies on Navy Corpsmen and other Naval medical personnel for medical care. USAF medics have frequently served attached to U.S. Army units in recent conflicts. Though all combat medical personnel are universally referred to as "medic", within different branches of the U.S. military, the skill level, quality of training and scope of work performed by medics varies from branch to branch. The U.S. Army commonly addresses Line Medics as "Doc" provided that they have earned the title, as it is not easily earned. As a result of the 2005 BRAC, the U.S. Department of Defense has moved most medical training for all branches of the armed forces to Fort Sam Houston of Joint Base San Antonio. A new Medical Education and Training Campus was constructed and the Air Force's 937th Training Group and Naval Hospital Corps School were relocated to Fort Sam Houston, joining the Army's existing Army Medical Department Center & School. Although each service has some training particular to its branch, the bulk of the course material and instruction is shared between medical personnel of the different services. ^ "The Academy of Health Sciences Course Catalog 2011 (Course #300-68W10)". U.S. Army Medical Department Center and School, Fort Sam Houston, TX. 2011. Archived from the original on 2013-02-20. Retrieved 2013-02-25. ^ "International Humanitarian Law - First 1949 Geneva Convention". Icrc.org. 1949-08-12. Archived from the original on 2011-11-12. Retrieved 2010-12-13. ^ Rottman, Gordon (2016). World War II US Army Combat Equipments. Oxford: Osprey Publishing. p. 54. ISBN 9781472814241. ^ "International Humanitarian Law - First 1949 Geneva Convention". Icrc.org. 1949-08-12. Archived from the original on 2011-08-16. Retrieved 2010-12-13. ^ "International Humanitarian Law - First 1949 Geneva Convention". Icrc.org. 1949-08-12. Archived from the original on 2011-09-03. Retrieved 2010-12-13. ^ "Customary IHL - Practice Relating to Rule 25. Medical Personnel". ihl-databases.icrc.org. Archived from the original on 18 October 2016. Retrieved 6 May 2018. ^ Middleton, Thomas A. (2010). "Saber's Edge: A Combat Medic in Ramadi, Iraq", p. 7. UPNE. ^ Middleton, Thomas (2009). Saber's Edge: A Combat Medic in Ramadi, Iraq. Lebanon, NH: University Press of New England. p. 8. ISBN 9781584657477. ^ Steve Elliott. "All military medical training roads now start at METC". Aetc.af.mil. Archived from the original on 2013-11-03. Retrieved 2013-02-08. ^ "BRAC 2005 recommendations expand Fort Sam Houston to become DoD's premier medical training base and the home of Army installation management, and management of family support activities and community program" (PDF). aetc.af.mil. Archived from the original (PDF) on 23 January 2014. Retrieved 7 March 2014. Wikimedia Commons has media related to Combat medics.